Silver Shaded Persians are not only known for their beautiful silvery white fur, but for their engaging green eyes. The standard, according to the Cat Fancier's Association (CFA), is that the eyes are either green or blue-green. Silver Shaded Persians are born with blue eyes and they slowly change over the first three years to their beautiful green color that enhance their wide-open and sweet expressions. There are two types of Persians based on their facial structure. Traditional Persians (Doll Face), which means they have a normal nose in length and placement in proportion to their facial structure. The other type of Persian is the Extreme Persian (Peeked Face), which has a pushed in nose, so short that people joke it looks like they've run into a wall. Truffle and Brulee are in between the Traditional and the Extreme, with Brulee having a flatter face than Truffle. Brulee's flatter face qualifies as a Brachycephalic, which means the shape of her skill is shorter than typical for cats. Brachycephalics can experience breathing problems and shorter or closed tear ducts. Instead of tears being funneled into the tear ducts, they spill out onto their face causing excessive tear production. Excessive tear production can cause tear staining, which is the reddish brown streaks that can appear under the cat's eyes (this is also possible with certain dog breeds) and it's really noticeable on cats with light fur. Mom Paula rarely shows photos of Brulee with dirty eyes, but we wanted you to see how bad her eyes can get if they aren't kept clean. The red color of the stains are because the tears contain porphyrins, which are molecules that contain iron as the result of the breakdown of red blood cells. Not only are the tear stains unsightly, they can also be uncomfortable and may lead to infection. The challenge for most cat owners (or dog owners) who have light colored fur is finding the best way to keep the eyes clean in a safe and effective way. We've already talked about the benefits of providing clean and fresh water for your cats and using a pet fountain with a filter can help at the basic level. Fresh, filtered water and a balanced and species-appropriate diet can help ensure a cat isn't taking in excess iron or impurities. We've read that rotating brands and flavors/recipes not only provides a variety of nutrients for cats, but it also gives them a break from the exact same amount of premixed vitamins and minerals they would get on a daily basis with the same brand/flavor. The first thing someone can do is to use a warm, damp cloth at least twice a day to clean around the eyes. Be very gentle, as this area is sensitive, especially if there are dried areas of the tears on the face. We've found that using baby wash cloths are thin and soft enough for cleaning our eyes. Supplements that help with detoxification, such as milk thistle, SAMe, dandelion, olive leaf, chlorophyll, colostrum, and probiotics have been known to reduce the amount of tear staining in some cats. We haven't tried any of these, but if we hadn't found a product that works for us, we would give them a try. We've had several vets to recommend using a simple eye wash or liquid tears on a daily basis to keep our eyes from drying out. Whatever you use, DO NOT use any products like milk of magnesia, medicated powders intended for humans, makeup remover, corn syrup, or hydrogen peroxide. There are a lot of tear stain removal products on the market and believe us, we've tried them. Most of the time, we've wasted our money and Mom Paula gets frustrated. Several years ago, Mom Paula read about a product on some Persian breeder pages that they highly recommended. This product was Eye Envy® and with regular use, we couldn't be happier with the products. 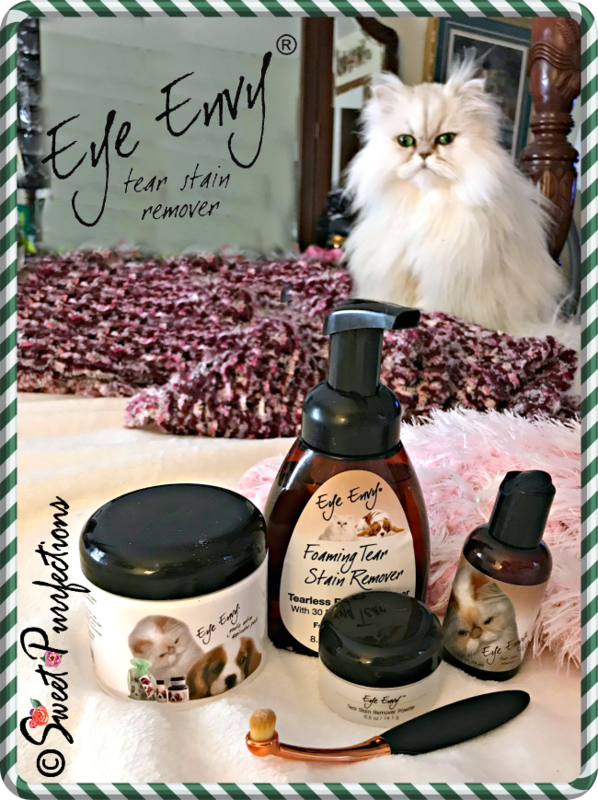 The Eye Envy Tear Stain Remover products for cats is all natural and involves a two-step process. Mom Paula still likes to clean Brulee's eyes with warm water on the baby wash cloth first. Once this is done, she cleans the areas around Brulee's eyes with the Eye Envy Tear Stain Solution for Cats (there is a different solution for dogs). There is an original formula which requires refrigeration and the Non-Refrigerated (NR) formula which we use. The ingredients are water, witch hazel, boric acid, and colloidal silver. This solution does not contain preservatives, Tylosin, bleach, peroxide, steroids, or antibiotics. The solution is topically applied around the eye area. 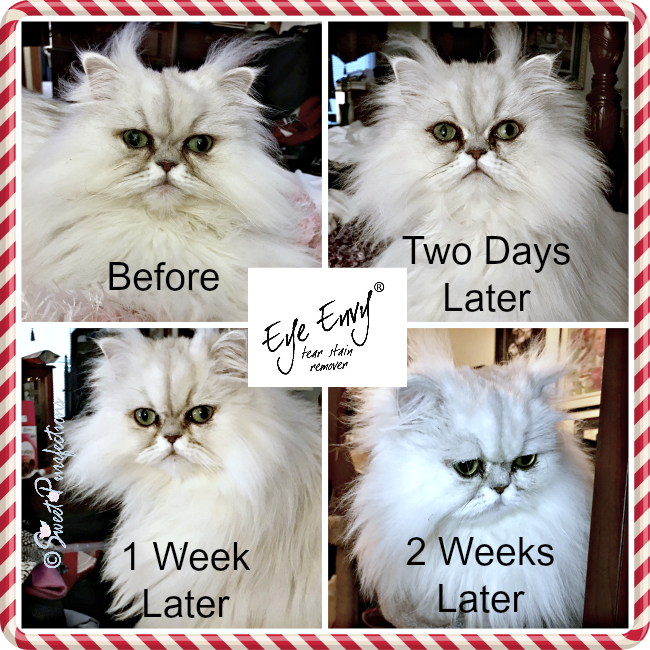 We recommend using the Eye Envy Pad because the texture doesn't have fibers that can get into your cat's eyes like normal cotton balls. To get into the corner near Brulee's eyes, Mom Paula does use a Q-Tip type applicator. Some people choose to pour the Tear Stain Solution into the Pad Jar so they will have moist pads to clean the eyes. If this is done, the jar must be refrigerated since it doesn't contain preservatives. The second step is to apply the Eye Envy Powder. The application powder is strongly recommended to use as an enhancer in the Eye Envy tear stain removal system. The application powder helps repel tears to keep the area dry to prevent the regrowth of tear stain causing bacteria. This powder doesn't contain bleach, cornstarch, or steroids. It is NOT a cover up, but an application to use once the eyes are cleaned. At first, Mom Paula had some difficulty putting the powder under Brulee's eyes without getting it in her eyes or nose. She tried using her fingers, but that wasn't too successful because of Brulee's small area below her eyes. Mom Paula then resorted to using human eye makeup brushes and Q-Tip applicators until Eye Envy released their ProPowder Applicator Brush last year! This brush is amazing. It's designed for the tear stain powder and has an ergonomically designed handle to help with applying the powder. The superfine fiber hair is anti-bacterial, washable, and made to pick up 5 times more powder than an ordinary brush. It's important to do this on a regular basis to help reduce and prevent tear staining, especially on Brulee's face. Truffle doesn't have much eye draining and a warm wash cloth is usually enough to keep her fur clean. We did use the Eye Envy to clean Truffle's fur when she had the ulcer on her eye this summer and there was a lot of staining with the medication over a two-week period. You can see from the photo above the difference this product made with Brulee's tear staining over a two-week period. Usually, Brulee's eyes are much cleaner, but with Mom Paula's two eye surgeries this past 6 weeks and Brulee's URI, Brulee's eyes weren't cleaned on a regular basis. 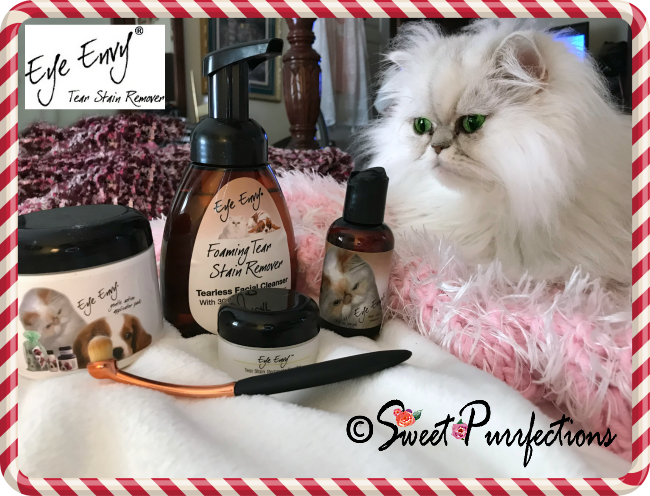 Eye Envy recently released its Foaming Tear Stain Remover and we received a bottle to try. This foaming facial cleanser contains 30ppm Colloidal Silver and works in conjunction with the liquid solution and powder to speed up the tear removing process. It contains water, mild cleansers, Colloidal Silver, Aloe Vera, Argan, Oil, Avocado Oil, Coconut Oil, and Vitamin E. It doesn't contain peroxide, bleach, steroids, or other harmful agents. We did use this on Brulee a few times, but it's a little more time consuming and Brulee isn't very patient when having her face cleaned. The directions are simple - wet, lather, and gently scrub the stained area. Let it sit for 5 minutes and then rinse while avoiding the eyes. Keeping Brulee still for the additional 5 minutes wasn't easy, but this product is only recommended on a weekly basis. We think the results of the above photos show the success of these products. Special Note - none of the photos were "doctored" and what you are seeing are actual results. With continued and regular use, Brulee's fur will be much cleaner with less tear stains. To help anyone get started with the Eye Envy Products, they've put together Starter Kits for both Cats and Dogs. You receive the exact same products we displayed in our photos, but in smaller containers. Eye Envy has agreed to offer our readers a 15% discount off their first order during the month of December 2017, using the code "brulee". Click on the links below to purchase your starter kit. 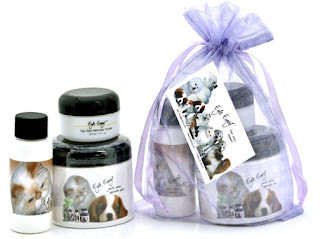 We're excited to announce that Eye Envy® has agreed to sponsor a giveaway as part of our 12 Days of Catmas holiday celebration to allow two of our readers have the opportunity to win a either an Eye Envy Starter Kit for Cats or an Eye Envy Starter Kit for Dogs. There is no purchase necessary. The giveaway is open to residents of the United States 18+ years, except where prohibited by law. The giveaway will run from December 12-19, 2017, ending at 11:59 pm ET. Two winners will be randomly selected by Rafflecopter (powered by Random.org) and notified via email. Winners will have 48 hours to claim their prize; failure to do so will result in forfeiture of the prize and a new winner will be randomly chosen. To qualify for the giveaway, a comment must be left on our blog post. Other entry options are available after a comment is left. Please check your email and be sure to add sweetpurrfections@sc.rr.com to your address book! Good luck! Yes, I entered! Because we actually could use this for Boodie! She doesn't have a Persian-type pushed in face, but she does have a flatter face than either Binga or me, and she does need her eyes cleaned often. Good for you. My sister had a blue merle Australian Shepherd and she had bad tear stains. I think Praline had them, but she had the darker face. Good luck! I have tear stains from my runny eyes. Maybe this would clean them up! Snowball had a big problem with this. Emmy has a blocked tear duct and I am always wiping her eye with a paper towel, this would be great. Our rescue kitten was found with a severe URI ... because of this, he seems to have eye discharge out of his right eye very often. We try and keep it clean with saline solution on a gauze pad. i clean out the little crud in their eyes everyday. somedays they dont have any. i use a warm washcloth. sometimes it gets in their beards and eyelashes. I gently wash around their eyes with a damp cloth. That does look like a pretty amazing product! Wow! Those are some pretty incredible products. And they work! I have 1 dog and 3 cats. My dog hasn't had any issue with tear stains but my cats have. My oldest cat Julius is almost 10 years old, she's a domestic short hair and has had runny eyes most of her life and has some tear stains. 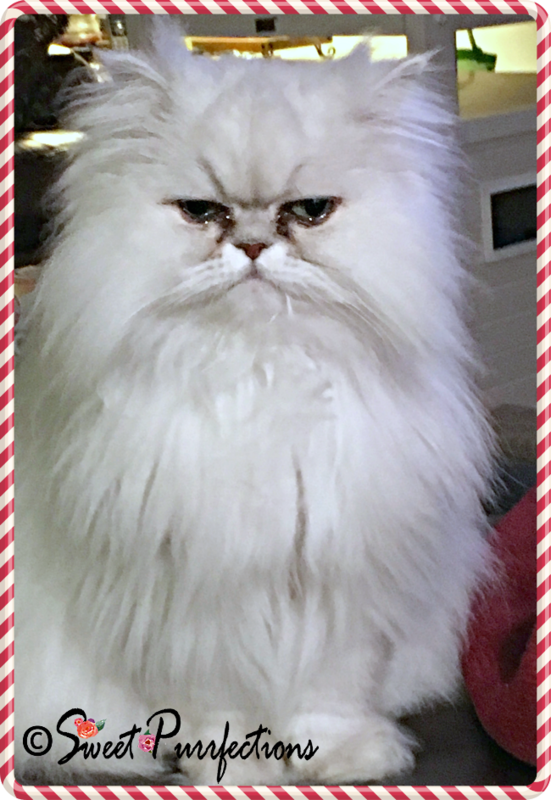 I also have a domestic long hair and our newest is a purebred Himalayan who is having some runny eye issues. I usually will just use a damp warm wash cloth and wipe their eyes which seems to help sometimes but for my oldest cat I could definitely use this for and my Himalayan. Wow what a great product. I've heard about colloidal silver and witch hazel before having benefits for humans too. The results Brulee got after just a few days is phenomenal. I can appreciate the fact that this products doesn't use harmful toxic ingredients. So important. This is a unique and useful product someone will be lucky to win. Good luck to the participants. Wow, cool! I've never had a pet with tear stains (somehow I seem to end up with dark-faced pups) but this seems like a really effective system! I'll totally help spread the word. I'm glad this is working for Brulee, she's such a beauty! Like you, we tried some different products in the past without much success. I just use a warm wash cloth when i have to clean my dogs eyes. I would choose the dog product. It sounds like these products are excellent for cats. I'd like to try out their dog formulas as well. My dog's allergies mean that he frequently has stained fur. I've been cleaning them frequently, but only using warm water because I wasn't sure what would be safe around his eyes. I guess it's time to try something new! I love cats but can't have one since my hubby is allergic. I had no idea the eye staining situation was a problem with cats (obviously, I've seen it in certain dogs). I also had no idea there were types of Persians. Both of your kitties are beautiful and I'm glad they look their best with this product! The products sound amazing and it's wonderful the difference it's made for Brulee. None of my cats ever had a problem with tear staining but my dog Jack does. I wonder how it would work for him? I wouldn't be able to use it unless I put a muzzle on him. I had looked into products in the past but for some reason I was quite nervous about trying anything near the eye area. I trust your recommendation so thanks I'm going to enter! I appreciate your trust. I’m very careful what I use on the girls, especially around their eyes. I am going to have to get some of that eye envy! I don't have much staining but - it is white fur under my eyes and because I have a defective eye duct one is always watering causing staining. Mom says sometimes it looks like I have a black eye! yikes! My mother desperately needs this for her two poodles who are both white and suffer terrible tear stains. I am also going to share this article with her so she can have a better understanding of what's going on with her pup's eyes. I learned a lot! I enjoyed how thorough this article is! You've made me appreciate how much care pet owners must dedicate to pets that have tear stains. My one cat will occasionally get some gunk in the corners of her eyes, but otherwise my cats have never had the issue you've described. Our poodle does though, as does my in-law's poodle, and it can look bad. I might have to check out a tear stain remover for dogs. I was introduced to Eye Envy when it first came out. I used it on my American Eskimo who had begun to have tear stains as a senior dog. It looks like they have really come a long way in improving the product. Now I know that I can safely recommend Eye Envy to others. I've always wondered what caused the tear stains in persians. Are these the same type of things that cause runny eyes in some of the smaller breeds of dog? Gosh, I wish I would have known about Eye Envy a few years ago. Our cat Sweet Pea (passed away in 2012) had a problem with tear stains. He was all white except his tail (not a Persian). I tried so many things, but it never seemed to . help. eyes in every one of your photos! Thanks for all the background information that you share explaining things. I really appreciate it. Yoda has tear staining but I hadn’t really thought about products that may help with them. Thanks for sharing! Mr. N also has a light-colored face so eye stains show up pretty well. I'd like to try Eye Envy on him. Your cats are so beautiful! I am so impressed with the difference you can clearly see in 2 weeks. These products work great and if I had a cat I would definitely use them. I use a warm wash cloth on my dogs eyes. I would love the dog care pack.